hanging out in the backyard with the pups // we are having a baby! exploring coronado heights // pretty haircut // i'm on top of the world- actually, just a bench. watching the sunset with hubs at cheney // lattes: his + hers // bumblebee! - binged on all my favorite shows because we finally got cable. - shared my phrase for twenty-sixteen: worship wildly. - witnessed this sweet moment between hubs and the neighbor kids. - we tried a new coffee shop -- ecclesia -- in wichita. it has turned into our favorite spot! - a random saturday morning turned into a memorable day. we were drinking lattes at one of our favorite coffee shops in wichita. he looked at me and told me he wanted to make some memories that morning. so we perused around the art museum for awhile. and then he took me to botanica. it was in the middle of winter, so there were no blooms. but it was still magical. - february is where my months of sickness began. it was one thing after another. there were days when i wondered if i'd always be sick and weary and down. - spring began its beautiful entrance this month. jared and i spent a beautiful saturday morning at botanica. - i randomly decided to cut four inches off my hair. it was so freeing. - husband and i celebrated our one year anniversary, which happened to fall on easter this year. we woke up to a winter wonderland. - i was a bridesmaid in my soul sistah's wedding! jared and i danced the night away and drank so much good coffee while in OKC. - april was really rough in terms of health. but there was also healing. i did recap bits + pieces of the month on the blog. - i was looking thru my phone + social media accounts. i kinda disappeared in the month of may. - lots of sunshine + iced coffee. - hubs and i camped a few times this month. - i consumed so many chai lattes this month. i was up to three a day at one point! - walked around botanica after a stressful day. floral therapy is a thing in my world. - attended a wedding, which means -- CAKE! - traveled to beautiful colorado at the beginning of the month. we celebrated the fourth of july there as well. - i learned a valuable lesson this month: leave work at work. - this month, i began my monthly me-time. this usually looks like a few hours of writing, painting, photographing, blogging, etc. it is so beneficial for all areas of my health. it spills over into my marriage + friendships + work life. - jared + i watched the olympics. we stayed up too late every night cheering for the US + it was easily one of my favorite memories from the summer. - hubs and i binged hard on stranger things. we are huge fans of that series! - God divinely intervened with our healthcare this month. we found our new doctor, and i will forever be grateful. - celebrated + welcomed my thirties! - started working in the nursery at church! BABIES. - participated in the blogtember challenge. - random tidbits from the month: hubs + i camped a couple times, cooked enough spaghetti to feed sixteen people, took a day trip up north, baked the best cookies evah, started watching parks + rec for the first time (! ), and i got one step closer to my wish of the 90s coming back: i bought a choker. - i really made a point to start cooking more this month. lots of pasta, but hey- better than frozen meals! - i enjoyed a salted caramel latte at luke's diner! - went to my first hockey game. the wichita thunder didn't win, but we had so much fun. - a normal monday ended as the day that i learned my life was changed forever - i found out i was pregnant! - after months of anticipation, i watched the gilmore girls revival. i still have major feelings about it all. - we celebrated thanksgiving in oklahoma with my family. jared experienced his first oklahoma earthquake! - hubs + i announced our pregnancy to the world! - while making dinner one night, i randomly had the biggest craving for a burger, fries, + peanut butter shake. jared was so sweet to drop what he was doing to go get it for me. the weirdest part was that i specifically craved a peanut butter milkshake, and i've never had one in my life. ha! - watched rogue one + passengers in theaters. both were really good. - celebrated christmas with both of our families. there was a moment when i looked at jared and realized this was our last christmas- just the two of us. i got a little emotional about it because only two christmases ago, i was single + wondering if i'd ever marry. God is so incredibly faithful. chasing perfect + good things + lessons learned in 2016.
i have been looking forward to december twenty-sixth for weeks. i woke up early on my day off and committed the entire morning to my twenty-seventeen powersheets! the founder of this awesome goal-setting planner, lara casey, is sharing her sixth annual make it happen goal setting series this week. i devote this entire week to planning for the coming year while reflecting on the current year. the prep work for the powersheets is good, y'all. i put on my praise music, sip a latte, and dive in. this year, instead of keeping it all to myself, i wanted to share bits + pieces of my progress. i'm following lara's outline in her blog post from today, if you want to explore the reasoning behind the questions first. i tried to chase a perfectly curated online life. as a photographer, it's a passion to capture the world around me. but it became evident this year that i can't always have the perfect photo. whether it be time or lighting or the fact that i'm just plain tired, many things caused me to feel like my creative gift was lacking. but this is something i desperately needed to become aware of because i was striving to succeed at things that don't matter and have no value. other areas include being a great wife, working homemaker, employee, etc. i wanted to be so great at everything. it was exhausting. there was no purpose at my attempts other than to be perfect at all the things. no grace and ultimately, not leaving any room for God in most areas. nothing i strived for was rooted in scripture or faith in the Lord. just self. me. myself. amber. as i wrote out these thoughts, the song, "when i survey" was playing. these lyrics hit me so hard that i knew it was a God thing the moment it happened. "all the vain things that charm me most, i sacrifice them to His blood." YES, LORD. the perfection, the things that hold my attention, all of it - i give it to Jesus because this isn't about anything but Him. only Jesus. i so needed that reminder. - grew in our marriage. - started helping out in children's ministry at church. - a great promotion at work. - God healed me from sickness after sickness. - God gave us a huge, beautiful blessing of a baby in my womb! - jared + i found a wonderful doctor. - we traveled to beautiful estes park, colorado for a fun vacation. - celebrated one year of marriage! - stood by my soul sistah as she married the love of her life. - attended my first hockey game. - countless laughs from our dogs, tyler + milo. - celebrated my thirtieth birthday. - watched the olympics with friends and had so much fun doing so. - let go of how i think things/situations/circumstances should go. this was a big lesson to learn -- and one i had to continuously learn throughout the year. i tend to have ideas of what things/people/situations should be [aka: how i want them to be.] but when i try to assert my control, i rob myself of the joy in learning from it. trying to will something to my preconceived notions only ends in disappointment. i'm learning to sit back and be teachable in those moments. there is room to grow + see in ways i don't expect when i stop expecting. beautiful moments + happenings aren't always planned. i'm holding everything with open hands. - our God is faithful to provide. this is not a new revelation in my life, but i was reminded of it in big ways this year. countless times, actually. from really rough health problems, work stresses, the discovery of my pregnancy, and just life in general, God was/is faithful to provide in the hardest of circumstances. this doesn't mean He gives me everything i want in the way + timing i desire. it means He hears my prayers + cries. He know it all. He provides what i need, just when i need it. always on time, always enough. - leave work at work. this was huge. i was bringing home the stresses, shortcomings, and mistakes from the day and letting them eat away at me at home. jared finally talked to me about his one evening while i was stewing over something from work [that most definitely wasn't as big of a deal as i made it out to be.] i have significantly noticed a change since i've put this into practice. i'll continue to do so in the coming year, which will be super helpful since a baby will be added into my daily life! - check out one book at a time from the library. ain't nobody got time to read five books at a time. - self-care is not selfish if done right + well. - little by little progress is so much better than procrastination. - finding the balance of a working wife while taking care of our home was so incredibly challenging. most days, i'd come home exhausted. laundry + dinner were the last things on my mind. jared helps out tremendously, but my heart wasn't in the right place about it all. thankfully, i have a better handle on it all. plus- it helps that i married a man who doesn't expect me to be the perfect wife. ever. he gives me the grace that i should probably give myself. - i have a cold right now, so not the greatest. and the only thing i can take while pregnant is benadryl. it makes me SO sleepy. i just want to feel better because- c'mon, it's christmas weekend! - this will sound weird, but i was so worried about getting a migraine throughout this pregnancy. my doctor told me that i couldn't take my normal meds, which is about the only thing that allows me to function when a migraine hits. well, on day one of thirteen weeks, i got one at work. the only thing i can take it tylenol. i popped two in and said a prayer for minimal pain. and guys. NOTHING. now i'm not thankful for the migraine itself, but i am grateful that i can tolerate them if another decides to grace me with its presence. no, we don't have a name picked out. no, we don't know the gender. i don't have a preference; i just want a healthy baby. - i worked in the nursery sunday night. i wasn't on the schedule, but they needed someone to fill in, so of course i said yes. it turned out to be a total God thing, y'all! i was paired with another sweet girl from the church who just so happens to be a mom + a nurse! with all the "advice" i keep receiving, i was curious to know her thoughts. by the end of the night, i was almost in tears because i know like the Lord paired us together to give me some peace of mind about pregnancy, vaccines, breastfeeding, birth, etc. it was so, so wonderful! creating: my end-of-2016 blog post. these are always my favorite to write. cooking: all the grilled cheese + tomato soup. drinking: lemon water. cherry seven-up. maple spice lattes. snacking: chocolate pudding. christmas cookies. reading: talking as fast as i can - lauren graham. watching: this is us, parenthood, parks + rec. looking: out the window at the pretty snow! playing: an old playlist i found on my macbook. dance party up in here! liking: the fact that i discovered a $240 credit with erin condren. anticipating: finding out the baby's gender! enjoying: reading through old blog posts. reminiscing + inspiration. wondering: what our baby will look like, be like, etc. loving: the new star wars movie! marveling: at this tiny babe growing in my belly. needing: to finish our christmas shopping. learning: to open up a little more to those around me. smelling: a delicious soy candle from target that smells like christmas. wearing: layers upon layers because it's stupid cold outside. noticing: gorgeous winter sunsets on my way home from work. thinking: about warmer weather. ha! giggling: at our crazy dogs. feeling: all the feelings because i'm pregnant. - grilled cheese + tomato soup. - cookies from the mall. the owner always gives me samples because he's an angel from cookie heaven. sliiiiightly more like myself. i have a little bit more energy, but naps are still a must on the weekends. making it to twelve weeks! the first trimester is filled with some uncertainty and questions. but baby looked great at the last ultrasound. heartbeat was 167. and just look at that face! baby was waving his/her hands all around and cue the tears. finding out the gender. once we know if it's boy or a girl, we can start talking about names and such. although i came across a girl's name this week and to my surprise, husband liked it, too! - not being grossed out by salad anymore. but guacamole is still out of the question. i have survived the first trimester of pregnancy, y'all! of course, i will admit that i've had it easy. like really easy. slight nausea, but only for two weeks. but the exhaustion - it's still here. i'll probably be tired for the next eighteen years. i started having cramps around week three. now i obviously didn't know i was pregnant at the time, and i started to worry if i had another cyst again. i ignored it for a few weeks, only to find out later that the cramps were due to growing a baby! they went away after ten weeks though. RUNNY NOSE ALL THE DAY LONG. ABSOLUTE DISGUST AT THE MERE MENTION OF CERTAIN FOODS. when i found out i was pregnant, i did what any first-time mother does: searched the internet for all the things. a lot of articles related to the first trimester mentioned food aversions, and i didn't really understand. but then i did. big time. jared would mention something for dinner - foods we've had several times - and all i would want to do is vomit at the mention of it. gross. it lasted through eleven weeks. i am an emotional person when i'm not pregnant. not in the crazy sense, but a good tear-jerker gets me every single time. pregnant amber is an emotional hot mess. like when i see other babies or when jared makes me smile because he knows i've had a crazy day or puppies or amazing maternity pants or getting a baked potato or.... you get the idea. it's comical- most of the time. i thought jared ate my rice once. RAGE FLOODED EVERY OUNCE OF MY BODY. he pointed to the other bag, where the rice was safe and sound. oops. sorry, babe! 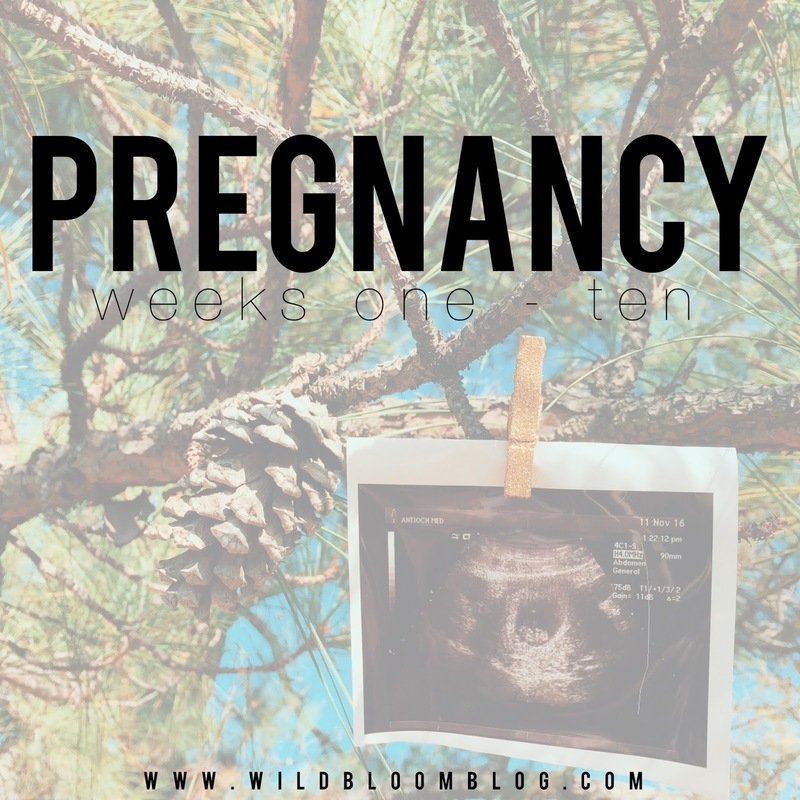 i had a burst of energy that lasted for about two hours on the day i turned eleven weeks. i cleaned like mad woman, and put away clean laundry that had been in the utility room for weeks. i was so flippin' tired after the energy wore off, but i finally felt like myself again. i'm told my energy will start coming back again soon, so fingers crossed! - over-hearing husband tell random people we see that i'm pregnant. he's a happy daddy-to-be! - finding out the gender. it's still several weeks away, but i'm so anxious to know! - a friend surprised me with tummy butter! - i've started waking up in the middle of the night to pee. - finding a comfortable sleeping position is proving to be difficult. cravings: nothing at the moment. there really isn't anything to document here. i had cramps nearly from the beginning, but showed no other symptoms other than a late cycle, which is totally normal for me. cravings: all the pintos + cheese. every moment of each day. after three positive home pregnancy tests, it was confirmed by my doctor that i was indeed with child! though we couldn't see the baby, my awesome doctor did an ultrasound that showed the sac where the baby was. cravings: rice + beans. watermelon jolly ranchers. suckers. the first trimester exhaustion hit me like a ton of bricks this week. the nausea started around lunch and lasted until dinner. and i thought i knew what tired was - NO. i did not. by the early afternoon, i needed a nap. i would go home and have no energy to do anything. our home was not the cleanest for the next few weeks. food aversions also started around week seven. i never imagined the thought of food could make me nauseous. i was a little scared this week. my nausea suddenly went away. i was so worried that this was a bad sign. everything was totally fine. every mama who was totally sick will not want to hear this, but my nausea only lasted for a few weeks. and even then, it wasn't bad. i just felt icky. i never had to stand over the toilet or anything like that. we also had our second appointment with our doctor. when i saw our baby on the ultrasound screen, it finally became real! and then he let us listen to the heartbeat . cue all the tears. what a surreal moment. cravings: give me all the baked potatoes in the world. still tired all. the. time. the exhaustion has let up just a little. still no nausea, but food aversions are still prevalent. i am not ashamed to admit that i bought a pair of maternity jeans this week. i haven't outgrown my other pants, but i just really wanted the pair i found at old navy. haha! we announced to the [social media] world about our sweet babe this week. a little earlier than i wanted, but there's a sweet/funny story as to why.